182. 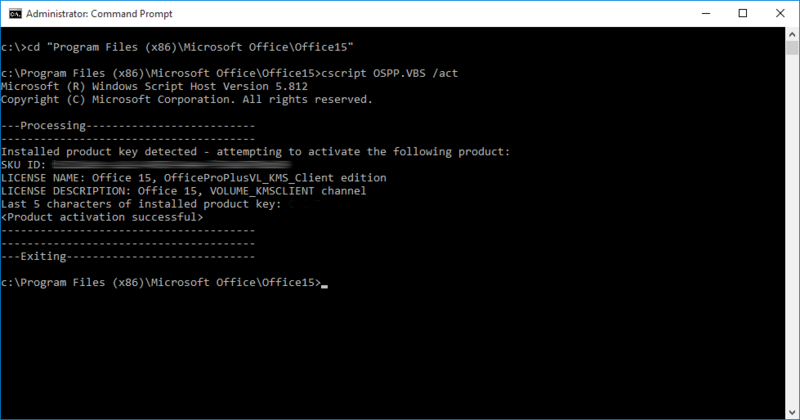 How do I activate my Office using KMS? See also: How do I force activation of Windows 10 using KMS? Microsoft Office 2010, 2013 or 2016 on Windows 7 or Windows 10 connected to the USER-AD, the university Active Directory (using the university accounts), should automatically activate on the university network. Connect computer to the wired network at your department. Start an elevated command prompt window - run cmd (command prompt) as administrator. Please see the FAQ How do I check if I am a local administrator in Windows? on how to do this. If the computer cannot find the KMS-server (you may be behind NAT in a virtual machine) you can try the command: slmgr /skms kms.user.uu.se first and then the command slmgr /ato to activate (Windows) or cscript ospp.vbs /act (just Office).